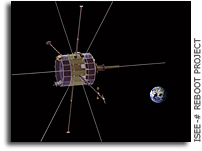 ISEE-3 Reboot Project: Critical Communications, The Mad Spaceball\n\n\"The ISEE-3 mission was launched in 1978. For those people that remember and who lived in that decade, computers and communications weren't near as sophisticated back then as they are now. Back then, Mattel's \"Football,\" an electronic game using LED dashes representing the football and players, was considered pretty fancy (I was so happy to get one for my birthday). The \"Speak & Spell\" debuted in 1978 (how would ET ever have gotten home without one?). The Commodore PET, Apple II, and Radio Shack TRS-80 were some of the big names in computing during 1978 (a person could max out the Apple II's RAM with 48k).\"\n\nFor him, satellite reboot is about reconnecting with an old friend, Los Angeles Times\n\n\"With ISEE-3 rebadged as the International Cometary Explorer, or ICE, Farquhar devised a flight path that rounded another libration point on the opposite side of the planet, boomeranged repeatedly around Earth and the moon, then used lunar gravity to sling the spacecraft through Giacobini-Zinner's plasma tail. From there, it would orbit the sun for eternity with a brief swing by Earth on Aug. 10 of this year. None other than science fiction author Arthur C. Clarke described the stunt as a mind-boggling feat. \"ICE's track looks like a plate of spaghetti, dropped from a considerable height,\" Clarke wrote in his autobiography, \"Astounding Days.\"